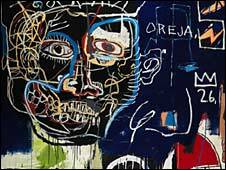 A painting by contemporary artist Jean-Michel Basquiat, belonging to rock band U2, will be auctioned next month. The Contemporary Art Sale takes place at Sotheby's in London on 1 July. Untitled (Pecho/Oreja), completed in 1983, is expected to fetch £4-6m. The current auction record for a Basquiat work stands at $14.6m (£7.4m). First spotted by bassist Adam Clayton in a New York gallery, the painting was was bought by U2 in 1989 and has since hung in the band's Dublin studio. "It seems especially appropriate that a work by Basquiat should end up in a music studio, since so much has been said about the relationship between his art and music," said Oliver Barker, of Sotheby's Contemporary Art department. Basquiat first came to public attention as a graffiti artist in New York in the late 1970s and collaborated extensively with Andy Warhol in the 1980s. He died of a drug overdose in 1988 and was later the subject of a film by fellow artist - and director - Julian Schnabel.